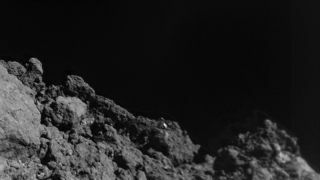 Another photograph snapped during MASCOT's landing on Ryugu. In a tweet, the team behind the lander explained that the photograph includes a faint beam of light reflected off MASCOT itself. MASCOT was a joint project of the German and French space agencies and was delivered to the asteroid Ryugu by the Japanese spacecraft Hayabusa2, which also captured images of the landing. Stitched together into a GIF, they show the lander entering from the upper left corner of the frame, then catching the light in the final image. MASCOT was designed to gather data for 16 hours, or about two of Ryugu's days. Scientists working on the mission were able to coax an extra hour of work out of the robot after realizing that its battery had enough juice to keep going. Before the power supply ran out, MASCOT beamed all the data gathered by its four instruments back up to the main Hayabusa2 spacecraft, so the information could be sent home to Earth. Scientists hope the data will help them understand what Ryugu is made of and how the solar system formed.